Its not quite the game Harry Potter plays, but Quiddich has taken off in the muggle world. There is no flying, but a combination of dodgeball, basketball & tag. The bludgers are used like dodgeball, the Quaffle is a volleyball, the snitch is a sock stuffed with a tennis ball. So the chasers play voleyball, the beaters dodgeball, the keeper guards the hoops and the seekers plays tag. Sounds a mite confusing. Its played around the world, USA, Canada, Australia. 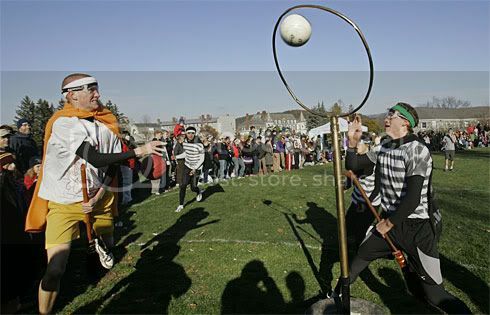 Like the other world cup, football, Quiddich started in England. But I'm not sure its been played here yet. Meanwhile in South Africa the World Cup continues. With all the talk of cutbacks, I wonder how few are mentioning the Salary of the England manager. Fabio Capello gets £6 million a year, his predecessors got half that. Then theres the Olympics, why not cut some of the excess there, and leave things like education alone. Sir Alf Ramsey got £7,500 in 1974. Don Revie was subsequently appointed on £25,000 a year as salaries for managers gradually rose over the next two decades. Terry Venables was understood to be on around £150,000 as England manager in 1996, followed by Glenn Hoddle on approximately £250,000 and then Kevin Keegan on an estimated £650,000. This changed with Sven-Goran Eriksson who was paid £2 million when first appointed in 2001. Steve McClaren got £2.5m-a-year.